This temple whose full name is 'Tenshukunzan Ganjoujuin' belongs to the Koyasan Shingon sect of Japanese esoteric Buddhism. The temple was established in 1189AD in the early Kamakura Era by Houjou Tokimasa who named it Ganjoujuin. He was the father of Houjou Masako, the wife of Minamotono Yoritomo who became the first Shogun of the Kamakura Era. The initial purpose of the temple was to wish for victory in the war fought by Minamotono Yoritomo against Oshu Fujiwara as revenge against the Heishi Clan and to restore the Genji Clan to power once more. Yoritomo was exiled to Izu by the Heishi Clan and lived there for 20 years before this war was planned. Thereafter it was used as the temple for the Houjou family who, over the next fifty years, expanded the temple and added further buildings to the temple complex according to the Azumakagami which is a record of all official evidence from the Kamakura Era. In 1222AD, Ganjoujuin was nominated as one of the Jogaku-ji ( government-subsidized temples ) with a relationship to the Imperial Court. As a result, the temple was further expanded. It is located at the bottom of a hill called Moriyama and was reached by crossing a bridge on an island in the middle of a large pond after passing through the main gate of the temple. This was a typical layout for a temple of the Fujiwara era and is referred to as ‘Joudo’ Style. It is one of seven temples built in Japan in this style. Famous examples being Moutsuji in Hiraizumi, Eifukuji in Kamakura and Joururiji in Kyoto which were built in the same period. The past layout of the temple was discovered after archeological surveys of the temple site and the surrounding area uncovered remnants of Ganjoujuin’s old buildings. 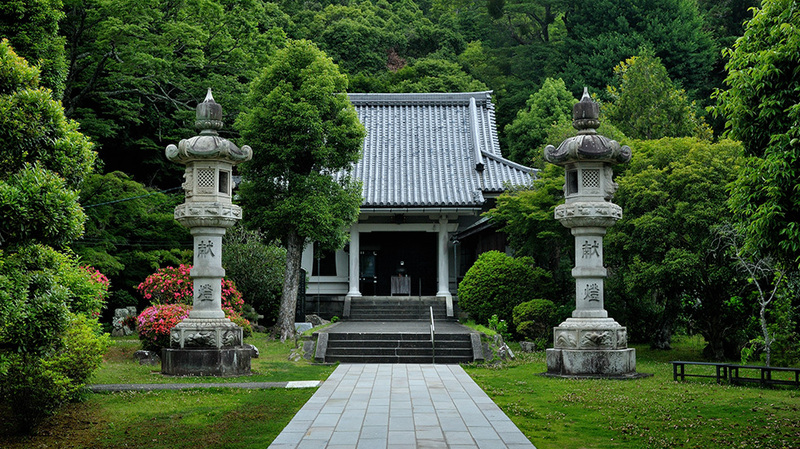 In 1973, the temple grounds and its surroundings were listed as an historic site by the Japanese government. All the original temple buildings from the Kamakura era were burnt to the ground in the 15th century by a warlord called Ise Shinkurou (later known as Houjou Souun). 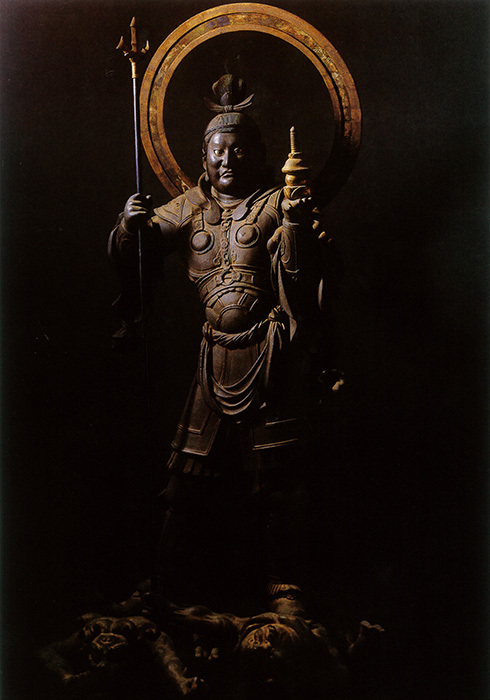 Miraculously seven Buddhist statues, including the five made by Unkei, survived the inferno. 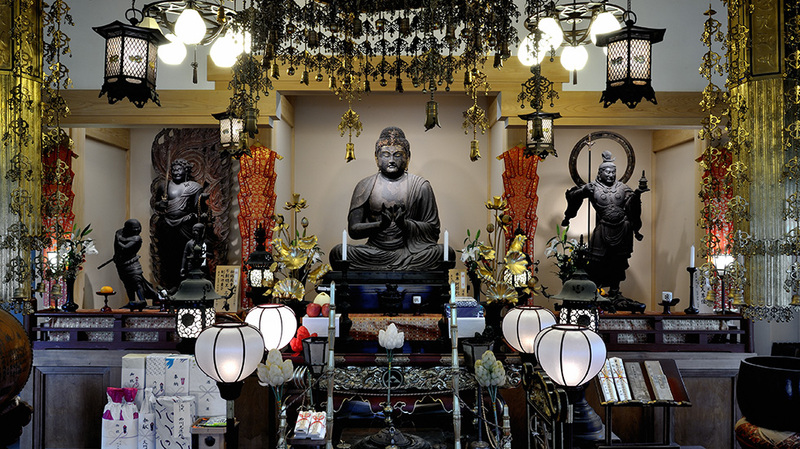 The statues now serve as a reminder of the golden age of the temple and serve as a testament to the glory of the Houjou Clan who were the paramount power of the Kamakura era. The five statues made by Unkei consist of Amidanyorai (the principal object of worship), Fudoumyouou, Kongaradouji, Seitakadouji and Bishamonten. Their provenance was confirmed by inscriptions on wooden tablets concealed within the bodies of the statues. 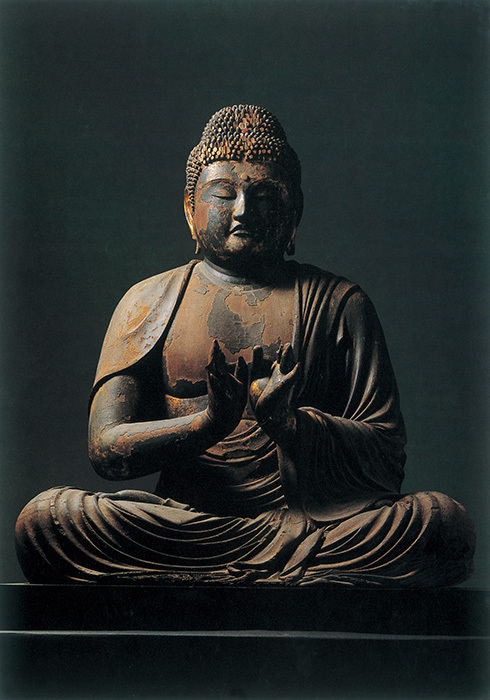 The statues were completed in 1186AD when Unkei was in his mid-thirties and are widely regarded as the best examples of his particular style and, indeed, of the Kamakura style of sculpture in general making the statues some of the most significant pieces in the history of Japanese sculpture. In 2013, the five statues and the four inscribed wooden tablets found inside them were designated as National Treasures by the Agency for Cultural Affairs (a subsidiary of the Ministry of Education, Culture, Sports, Science and Technology). 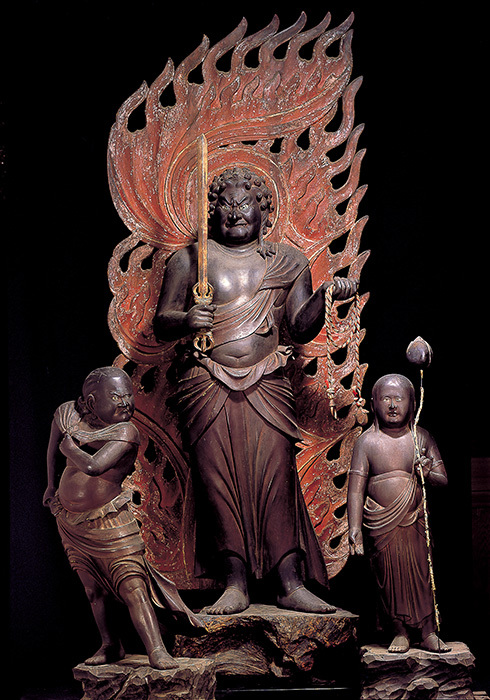 Another statue of Amidanyorai housed in the Hondou (the temple’s thatched main building) and a statue of Houjou Masako housed in the Houmotsukan (treasure hall), made on the 6th anniversary of her death, are both considered masterpieces of Japanese religious sculpture from the Keiha school of the 13th century. They have both been designated Important Cultural Properties by the Shizuoka prefectural government. Within the current temple grounds are the tombs of Houjou Tokimasa who first established Ganjoujuin, and Prince Ashikaga Chachamaru who was killed at the temple in the latter half of the 15th century when Houjou Souun raised it by fire. The area of Ganjoujuin is steeped in over 800 years of history. As home to the Houjou Clan and where Minamotono Yoritomo raised his army, it was the starting place of the Kamakura government. The five statues by Unkei offer you a small, but significant glimpse into this rich history. In 1186AD, one year after the fall of the Heike Clan, Unkei, then in his mid-thirties, completed these five statues. For Unkei, who was based in Nara, this was his first work in the eastern area of Japan now known as Kantou. He carved them in a realistic, expressive and muscular new style that marked the beginning of a distinctive Kamakura sculptural style making these statues a milestone in the history of Japanese sculpture. 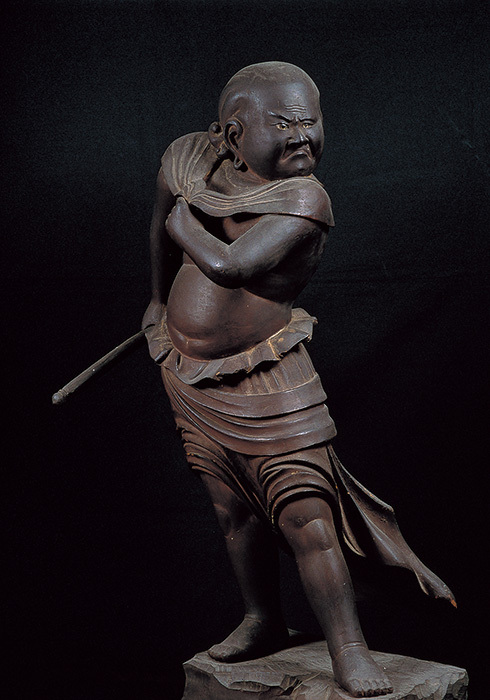 The strong, powerful figure of Amidanyorai creates a weighty impression that belies the statue’s wooden construction. In contrast, the deeply carved rippling robe seems to almost float around Amidanyorai demonstrating the high level of skill that Unkei had. 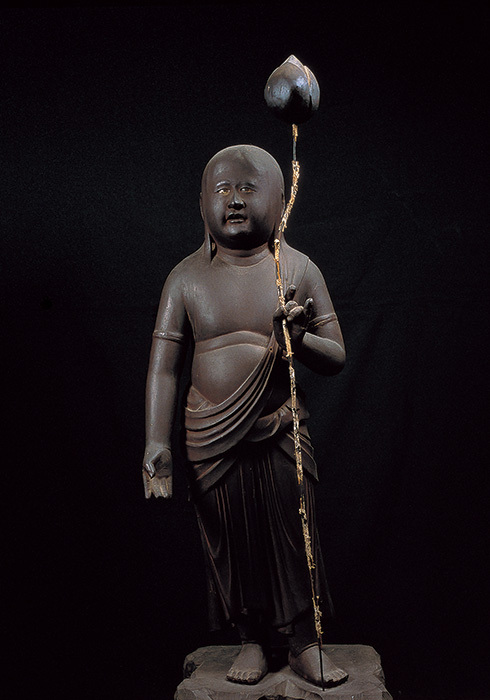 Amidanyorai was carved with his hands in a pose called Seppo-in that signifies one is preaching the teachings of Buddha and manmousou (webbed fingers) to demonstrate that nobody would slip though his fingers as a symbol of hope in what were very tempestuous times. 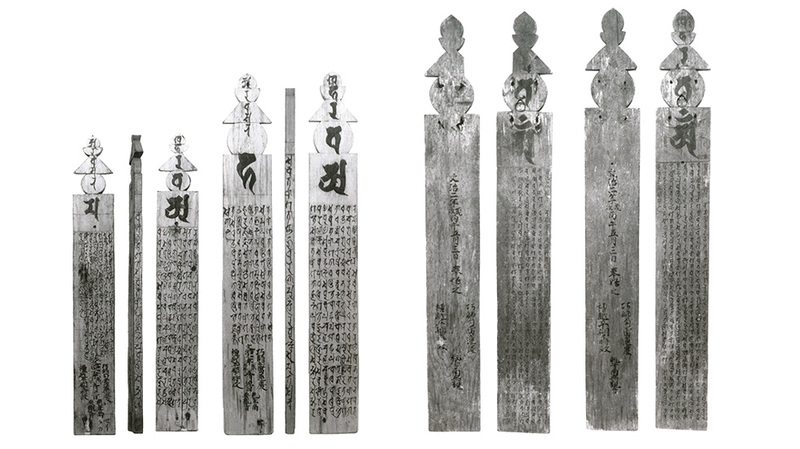 National Treasures/Made by Unkei in 1186AD/ Heights: 137.2cm, 74.4cm 83.5cm respectively. Fudoumyouou stands with a strong, youthful body. In his left hand is a lasso while in his right hand is a sword. His crystal eyes stare out from under sharply raised eyebrows in furious outrage. In front of him on the left stands Kongaradouji looking innocent and honest while to the right stands Seitakadouji who, with his forrowed brow, pursed lips and frown, looks mischievious with a club in his hand. Accompanied by these two, Fudoumyou, through the power of Buddhism tries to save people from difficulty and disaster. With two devils trapped beneath his feet, the virile and dynamic figure of Bishamonten stands staring out tensely through crystal eyes resembling the image of a young samurai, perhaps inspired by a warrior that Unkei actually met during his time in eastern Japan. As a symbol of warlike spirit and good luck , Bishamonten was revered by Samurai and ordinary folk alike. Two large wooden tablets were discovered inside the statues of Fudoumyou and Bishamonten. Another two small wooden tablets were discovered inside the statues of Kongaradouji and Seitakadouji. The two large tablets have small holes which confirm they were originally used to secure small pots containing pieces of Buddha’s bones. Sadly, the pots and the pieces of Buddha’s bones held within are no longer present having long since disappeared in the mists of time. On all four of them is written a sutra called The Karaṇḍamudrā Dhāraṇī (Japanese: Hōkyōin darani 宝篋印陀羅尼) in Siddham script (a form of Sanscrit). They also record other information about the Buddhist statues including that the work started from 11th May 1186AD, that the patron was Houjou Tokimasa, the sculptor was Unkei and the writer of the inscriptions was Namukannon. No smoking is permitted within the temple compound. Do not damage the cultural properties, national treasures, historic site, buildings or the environment. No use of photographic/video equipment is permitted within the main viewing hall or treasure hall. No picking of flowers or other plants is permitted. Removal of wildlife from the temple grounds is not permitted. No inappropriate behavior that may bother other patrons is permitted. Pets are permitted within the temple compound, but not inside the main viewing hall or treasure hall. Please remember to keep your pet on a leash and to clean up after it. The nearest railway stations are Nirayama and Izunagaoka on the Izuhakone railway line which shares a terminal with the JR Toukaidou and Shinkansen lines at Mishima Station. The temple is about 15 minutes walk from both Nirayama and Izunagaoka stations, but if you wish to get a taxi or use the local tourist shuttle bus or rent a bicycle, please use Izunagaoka station. There is also a tourist information office at Izunagaoka station. Follow National route 136 towards Shuzenji. Once you are in Nirayama, there will be an ESPOT supermarket on your left. The road leading to Ganjoujuin is directly opposite and is well sign-posted.